About 35 people turn out for a public workshop Wednesday to help redesign the park next to City Hall. WATERVILLE — Imagine Castonguay Square downtown with an archway close to Main Street, through which visitors enter the park. To their left is a calming water fountain, tables where people may sit or do art projects; to the right, the historic horse watering trough that has been in the square for many years. Walkways meander through the park like those at the RiverWalk at Head of Falls. In fact, one walkway ends toward Front Street to indicate a connectivity to the waterfront. Everywhere are green plantings, flowers and creative lighting. The 150-year old elm tree, nicknamed “Ellie” by City Manager Michael Roy, stands tall in the heart of the square, looming higher than City Hall to its north. On the Front Street end of the park is a small outdoor theater space that might seat 50 people. Those were some of the ideas generated Wednesday by participants at a public workshop who are helping to redesign Castonguay Square, the public park between City Hall and Common Street. 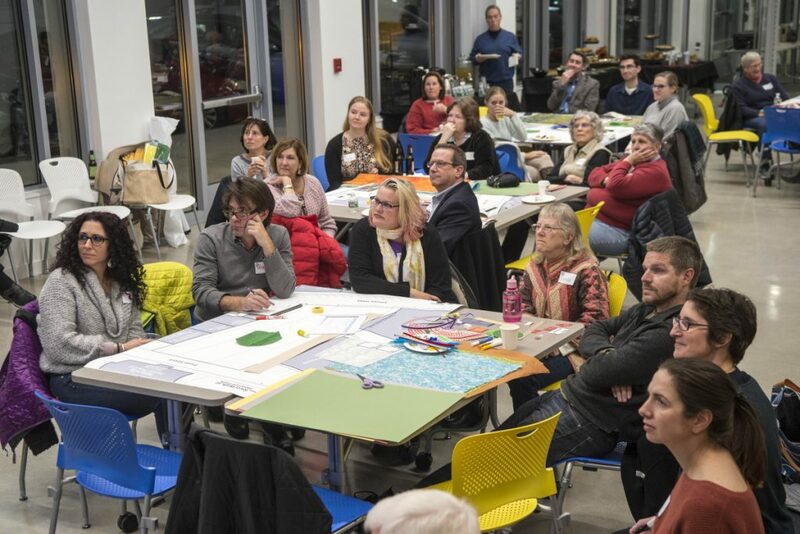 About 35 people, including city officials, those who work in the arts, business owners and others turned out for the workshop, held in the Chace Community Forum in the Bill & Joan Alfond Main Street Commons downtown. It was the second of three workshops being held to get input from the public on redesigning the square. Participants seated at five tables Wednesday used colored, textured paper; scissors; wood sticks; glue; and other materials to stick features on a map of the square, which is about an acre in size. Serena Sanborn, education and outreach coordinator for Waterville Creates!, which hosted the workshop with the city and Colby College, worked at a table with Linda Woods, Sustain-Mid Maine Coalition coordinator, Erik Thomas, who recently was elected city councilor for Ward 7; City Manager Michael Roy; Peter Nadeau, a museum exhibit designer; and Sue Gauthier. Sanborn generated the idea of having meandering walkways in the square that resemble the movement of water in the river, such as the walkways at the RiverWalk. She also favored keeping the horse trough, she said. Woods, who has an office in City Hall, said she wanted the square to feature quiet, peaceful spaces. Roy raised the idea of having a water fountain in the square, which had one many years ago, and Nadeau generated the idea of including the small theater on the Front Street end. The planning part of the square’s redesign is funded by a grant from the National Endowment for the Arts’ Our Town program, with support from the city and Colby, and seeks input from area residents, businesses and others on how the park can serve the community best. 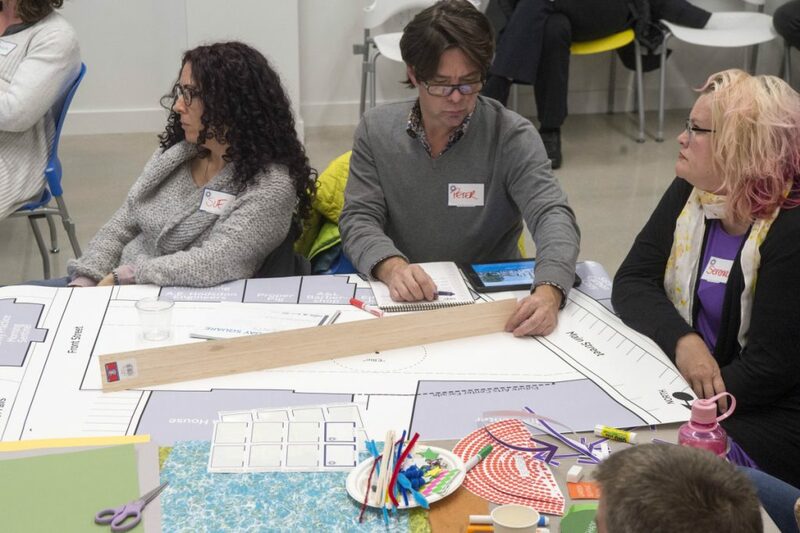 Wednesday’s workshop focused on interactive visioning, sketching and design, using principles and ideas discussed at the first workshop, held last month. At that workshop, participants discussed some features in Castonguay Square they thought should be kept in the park, including the old elm tree and the horse watering trough. Some people at that October meeting said features that should be removed include an information kiosk at Main Street that not only blocks the view of the square, but also hinders access to it. The workshops are being held as Waterville Creates! and Colby work to raise $18 million to $20 million to transform The Center next to the square into a hub for art and film. Waterville Creates! earlier this year was awarded a $75,000 grant from the National Endowment for the Arts’ Our Town program for the redesign planning process. Two teams of architects are working with Waterville Creates!, Colby and city officials in hosting the workshops: Bob Metcalf and Julia Frederick, landscape architects from Mitchell & Associates, of Portland; and Neil Kittredge and Rayna Erlich, architects from Beyer Blindle Belle, of New York. Mitchell & Associates designed the RiverWalk. Kittredge on Wednesday gave a brief history of the park, which was acquired in the 1840s for $540. The only green space in the heart of downtown, the square was redesigned in 1986 to include a pedestrian promenade, trees and a walkway across its middle. Kittredge said now is an exciting moment to re-imagine the square. The square is used for all sorts of activities, including the farmers market, the Taste of Waterville, the holiday festival Kringleville, Waterville Rocks! concerts, weddings and more. 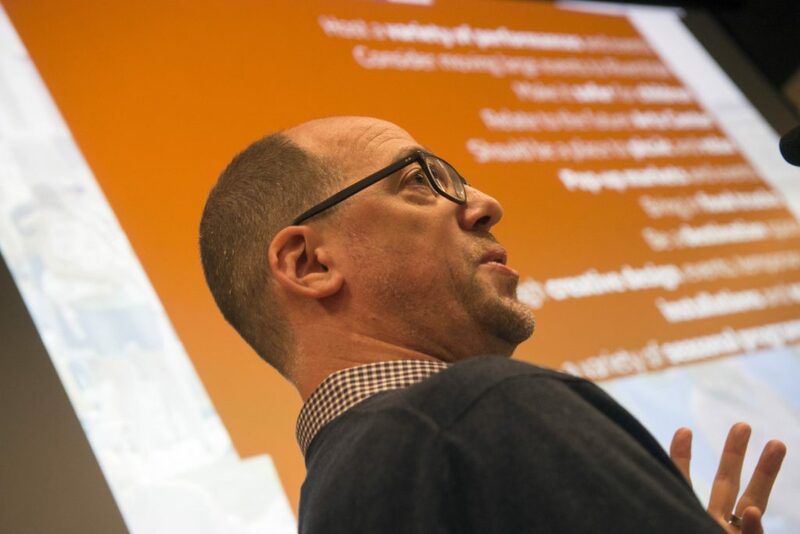 The architects plan to develop three preliminary design concepts following the two workshops with an eye toward presenting them to the community for feedback at a final workshop in January. A final design is expected to be presented in February to the City Council. 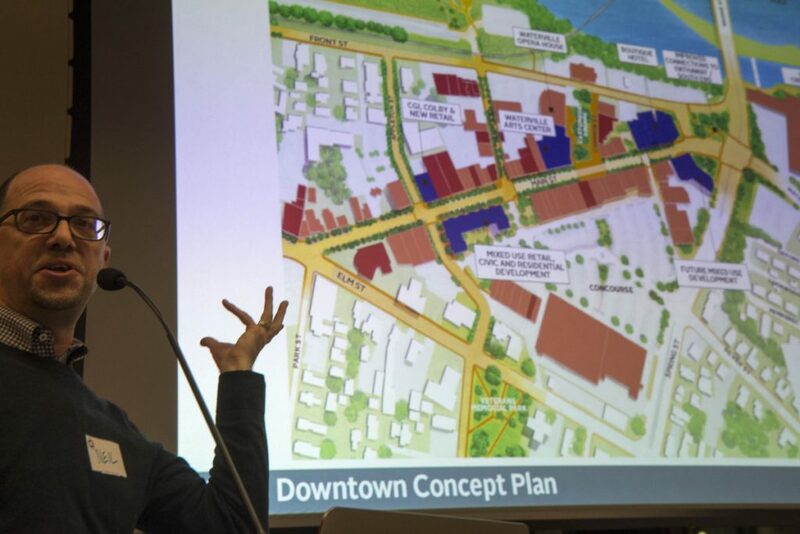 Kittredge explained that people who took part in last month’s workshop, several of whom were at Wednesday’s event, discussed how an arts space could enhance the square. The park could have places to sit, possibly a food truck and holiday pop-up shop — and become a destination place, according to workshop participants. Kringleville is set up in the square for the holiday season but after that, the square lies dormant, Kittredge said. But in other parks, which Kittredge pointed out on slides, winter does not end. Possibilities for winter uses include a skating area, space for ice sculpting, an ice bar, skiing, and a fire pit. He said a few principles raised at the October meeting include the importance of making the square family-friendly, welcoming to all and a place people put on their “must-see” lists; re-energizing the square as a center for art, history and culture; making it a unique part of the experience of downtown’s local business and economic vitality; maintaining it as green, open space with a connection to nature in the heart of downtown; designing it as a super-flexible space for daily use and all kinds of special year-round events; and restoring its connection to Main Street — and making a new connection to Head of Falls. Mayor Nick Isgro; former Rep. Marilyn Canavan; businessman Bill Mitchell and his wife, Vicki; Cindy Jacobs, president of the Board of Trustees for Waterville Public Library; and Garvan Donegan, senior economic development specialist for the Central Maine Growth Council, were among those who attended Wednesday.